Fire is captivating and a flaming drink can really add to the party. The flaming Dr. Pepper is one of the most popular flaming shots you can make and the namesake soda is not needed. Instead, when the drink is lit on fire, magic happens and the combination of rum, amaretto, and beer mimics the taste of Dr. Pepper. The effect really is amazing, but playing with fire while drinking requires some caution. Spilling the flaming drink or accidentally catching your hair or clothing on fire can not only end the party quicker than you'd like, but it can also lead to serious injury or damage. While you can make the flaming Dr. Pepper at home, sometimes it is best to simply order this one at the bar and let the professionals handle it. The shot is served either as a dropped shot (aka bomb) or you can build it inside a beer glass. The bomb shot is the most popular way to serve this shooter. Some people do not blow out the flame before dropping it, but this really is not the best idea. There's always the chance that the larger glass will break and spread burning alcohol all over your table or bar. Either way, carefully drop the shot glass to minimize the impact on the glasses and avoid burning yourself. Fill a shot glass 3/4 full with amaretto. Slowly float the overproof rum on top to fill the glass by pouring it over the back of a bar spoon. Ignite the contents of the shot glass. Blow out the flame, drop the shot glass into the beer, and drink in one gulp. The other option is to build your flaming Dr. Pepper in a pint glass. You'll still need the shot glass, but this method doesn't require you to actually drop it. It is a little trickier to pour and you'll want to take your time. One trick to pulling it off is to use a shorter pint glass that is just a little taller than your shot glass. Tall pints don't leave you much room to maneuver. Pour the amaretto into a shot glass until it's 3/4 full and float the rum on top. Place this glass inside a larger glass. Carefully pour beer around the edges until it almost reaches the rim of the shot. Light the rum on fire (use a long lighter if needed) and let it burn for about 30 seconds. The rum is an important element to this shot. Your average 80-proof rum will not light on fire and, if it does, the effect will not be the same. The key to getting a good flame is to use a high-proof rum because it has a higher concentration of flammable alcohol. That is why 151-proof rums are recommended. You can find it from brands like Cruzan and Goslings at almost any liquor store. While it may be tempting to use grain alcohol like Everclear, it defeats the purpose of the flaming Dr. Pepper. Yes, the liquor is 151-proof (or higher) and it will start on fire, but the point of this shot is to recreate the taste of Dr. Pepper and rum is the only way to do that. With any flaming drink, there are some precautions you should take. It is not uncommon for someone to lean over the flame and catch their hair or shirt sleeve on fire. Also, you don't want any flaming liquor to spill on your bar. Extinguish the flame before consuming the drink. It's just the smart thing to do because the burning alcohol can run down your chin and start your clothes on fire. In the least, you'll singe some nose hairs. Do not make this drink when you are already drunk or serve it to someone who is. Play it smart and if you're making this at home, enjoy it at the beginning of the night when you're still with it. Tie back long hair and get control of loose clothing before playing with fire. Do not reach over the flaming shot and keep all flammables out of the way when you go to blow it out. Be prepared and have a fire extinguisher ready. Seriously, nothing ruins the party faster than a fire that gets out of control. Do you think we're overly cautious about fire safety? 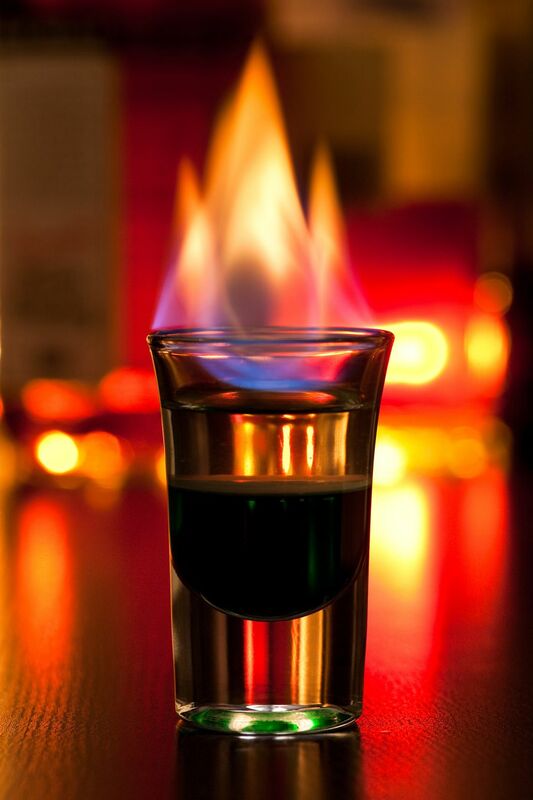 There is plenty of evidence that flaming shots can go wrong in an instant. Do a search on YouTube for "flaming shot fail" and you'll see many examples that prove the point. How Strong Is a Flaming Dr. Pepper? The flaming Dr. Pepper is notorious for contributing to some nasty hangovers, but it's really not a strong shot on its own. The actual alcohol content falls at just 11 percent ABV (22 proof), or the equivalent to a glass of wine. The more likely culprit to those morning-after pains is the party atmosphere and the fact that this shot is often just one of many drinks people slam in a night. As always, if you want to avoid the hangover, have fun but try not to get carried away.